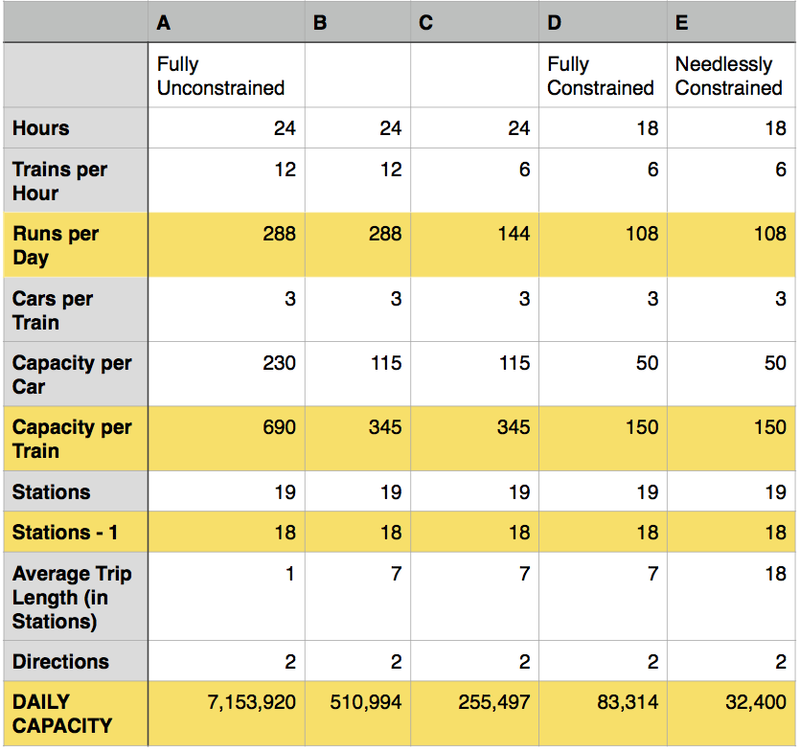 At any rate, the attached table shows some surprisingly high numbers, up to 7 million (under the admittedly silly unconstrained scenario (A) where people only ride the train for 1 stop before alighting, trains run for 24 hours a day, and people are standing at near crush capacity), with more plausible numbers in the 255,000 territory, assuming everyone gets a seat, but you can run at 5 minute headways (C). Here we are limited by capacity in one section (downtown Minneapolis), which does run at 5 minute headways, but splits the capacity between the Green and Blue lines. Trying to balance LRT peak loading via pricing is not likely to be realistic unless there is also peak pricing for other modes. It will just drive choice riders back to their cars. If we apply peak pricing to our roads and streets, most congestion would go away and capacity would increase but that’s not happening anytime soon. The realistic capacity is based on demand for the peak hour in the peak direction. That’s the big capacity control for roads, buses and rail.